This article is about the national anthem of the Netherlands. It is not to be confused with the grand ducal anthem of Luxembourg, De Wilhelmus. "Wilhelmus van Nassouwe", usually known just as the "Wilhelmus" (Dutch: Het Wilhelmus; pronounced [ɦɛt ʋɪlˈɦɛlmɵs] ( listen); English translation: "The William"), is the national anthem of the Kingdom of the Netherlands. It dates back to at least 1572, making it the national anthem with the oldest music. Although the "Wilhelmus" was not recognized as the official national anthem until 1932, it has always been popular with parts of the Dutch population and resurfaced on several occasions in the course of Dutch history before gaining its present status. It was also the anthem of the Netherlands Antilles from 1954 to 1964. Protestant confessions in Europe in the 16th century. Calvinism (cyan) was adopted by a majority of the population in the Netherlands. The "Wilhelmus" originated in the Dutch Revolt, the nation's struggle to achieve independence from the Spanish Empire. It tells of the Father of the Nation William of Orange who was stadholder in the Netherlands under the King of Spain. In the first person, as if quoting himself, William speaks to the Dutch people about both the revolt and his own, personal struggle: to be faithful to the king, without being unfaithful to his conscience: to serve God and the Dutch people. In the lyrics William compares himself with the biblical David who serves under the tyrannic king Saul. As the merciful David defeats the unjust Saul and is rewarded by God with the kingdom of Israel, so too William hopes to be rewarded a kingdom. Both the "Wilhelmus" and the Dutch Revolt should be seen in the light of the 16th century Reformation in Europe and the resulting persecution of Protestants by the Spanish Inquisition in the Low Countries. Militant music proved very useful not only in lampooning Roman clerks and repressive monarchs but also in generating class transcending social cohesion. In successfully combining a psalmic character with political relevancy, the "Wilhelmus" stands as the pre-eminent example of the genre. The melody of the "Wilhelmus" was borrowed from a well known Roman Catholic French song titled "Autre chanson de la ville de Chartres assiégée par le prince de Condé" or in short: "Chartres'". This song ridiculed the failed Siege of Chartres in 1568 by the Huguenot (Protestant) Prince de Condé during the French Wars of Religion. However, the triumphant contents of the "Wilhelmus" is the opposite of the content of the original song, making it subversive at several levels. Thus, the Dutch Protestants had taken over an anti-Protestant song, and adapted it into propaganda for their own agenda. In that way, the "Wilhelmus" was typical for its time, since It was common practice in the 16th century for warring groups to steal each other's songs in order to rewrite them. Even though the melody stems from 1568, the first known written down version of it comes from 1574, in the time the anthem was sung in a much quicker pace. Dutch composer Adriaen Valerius recorded the current melody of the "Wilhelmus" in his "Nederlantsche Gedenck-clanck" in 1626, slowing down the melody's pace, probably to allow it to be sung in churches. The current official version is the 1932 arrangement by Walther Boer. The origins of the lyrics are uncertain. The "Wilhelmus" was first written some time between the start of the Eighty Years' War in April 1568 and the Capture of Brielle on 1 April 1572, making it at least 446–447 years old. Soon after the anthem was finished it was said that either Philips of Marnix, a writer, statesman and former mayor of Antwerp, or Dirck Coornhert, a politician and theologian, wrote the lyrics. However, this is disputed as neither Marnix nor Coornhert ever mentioned that they wrote the lyrics, even though the song was immensely popular in their time. The "Wilhelmus" also has some odd rhymes in it. In some cases the vowels of certain words were altered to allow them to rhyme with other words. Some see this as evidence that neither Marnix or Coornhert wrote the anthem, as they were both experienced poets when the "Wilhelmus" was written, and it is said they would not have taken these small liberties. Hence some believe that the lyrics of the Dutch national anthem were the creation of someone who just wrote one poem for the occasion and then disappeared from history. A French translation of the "Wilhelmus" appeared around 1582. Recent stylometric research has mentioned Petrus Dathenus as a possible author of the text of the Dutch national anthem. Dutch and Flemish researchers (Meertens Institute, Utrecht University and University of Antwerp) discovered by chance a striking number of similarities between his style and the style of the national anthem. The complete text comprises fifteen stanzas. The anthem is an acrostic: the first letters of the fifteen stanzas formed the name "Willem van Nassov" (Nassov was a contemporary orthographic variant of Nassau). In the current Dutch spelling the first words of the 12th and 13th stanzas begin with Z instead of S.
Like many of the songs of the period, it has a complex structure, composed around a thematic chiasmus: the text is symmetrical, in that verses one and 15 resemble one another in meaning, as do verses two and 14, three and 13, etc., until they converge in the 8th verse, the heart of the song: "Oh David, thou soughtest shelter from King Saul's tyranny. Even so I fled this welter", where the comparison is made between not only the biblical David and William of Orange as merciful and just leader of the Dutch Revolt, but also between the tyrant King Saul and the Spanish crown, and between the promised land of Israel granted by God to David, and a kingdom granted by God to William. 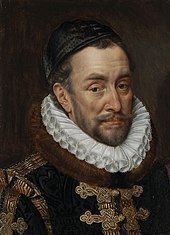 In the first person, as if quoting himself, William speaks about how his disagreement with his king troubles him; he tries to be faithful to his king, but he is above all faithful to his conscience: to serve God and the Dutch people. Therefore, the last two lines of the first stanza, indicate that the leader of the Dutch civil war against the Spanish Empire of which they were part, had no specific quarrel with king Philip II of Spain, but rather with his emissaries in the Low Countries, like Fernando Álvarez de Toledo, 3rd Duke of Alba. This may have been because at the time (late 16th century) it was uncommon to publicly doubt the divine right of kings, who was accountable to God alone. In 1581 the Netherlands nevertheless rejected the legitimacy of the king of Spain's rule over it in the Act of Abjuration. "Duytschen" (in English generally translated as "Dutch", "native" or Germanic) in the first stanza is a reference to William's roots; its modern Dutch equivalent, "Duits", exclusively means "German", and it may refer to William's ancestral house (Nassau, Germany) or to the lands of the Holy Roman Empire, including the Netherlands. But most probably it is simply a reference to the broader meaning of the word, which points out William as a "native" of the fatherland, as opposed to the king of Spain, who seldom or never visited the Netherlands. The prince thus states that his roots are Germanic rather than Romance – in spite of his being Prince of Orange as well. Though only proclaimed the national anthem in 1932, the "Wilhelmus" already had a centuries-old history. It had been sung on many official occasions and at many important events since the outbreak of the Dutch Revolt in 1568, such as the siege of Haarlem in 1573 and the ceremonial entry of the Prince of Orange into Brussels on 18 September 1578. It has been claimed that during the gruesome torture of Balthasar Gérard (the assassin of William of Orange) in 1584, the song was sung by the guards who sought to overpower Gérard's screams when boiling pigs' fat was poured over him. Gérard allegedly responded "Sing! Dutch sinners! Sing! But know that soon I shall be sung of!". Another legend claims that following the Navigation Act 1651 (an ordinance by Oliver Cromwell requiring all foreign fleets in the North Sea or the Channel to dip their flag in salute) the "Wilhelmus" was sung (or rather, shouted) by the sailors on the Dutch flagship Brederode in response to the first warning shot fired by an English fleet under Robert Blake, when their captain Maarten Tromp refused to lower his flag. At the end of the song, which coincided with the third and last English warning shot, Tromp fired a full broadside, thereby beginning the Battle of Goodwin Sands and the First Anglo-Dutch War. During the Dutch Golden Age, it was conceived essentially as the anthem of the House of Orange-Nassau and its supporters – which meant, in the politics of the time, the anthem of a specific political faction which was involved in a prolonged struggle with opposing factions (which sometimes became violent, verging on civil war). Therefore, the fortunes of the song paralleled those of the Orangist faction. Trumpets played the "Wilhelmus" when Prince Maurits visited Breda, and again when he was received in state in Amsterdam in May 1618. When William V arrived in Schoonhoven in 1787, after the authority of the stadholders had been restored, the church bells are said to have played the "Wilhelmus" continuously. After the Batavian Revolution, inspired by the French Revolution, it had come to be called the "Princes' March" as it was banned during the rule of the Patriots, who did not support the House of Orange-Nassau. However, at the foundation of the Kingdom of the Netherlands in 1813, the "Wilhelmus" had fallen out of favour. Having become monarchs with a claim to represent the entire nation and stand above factions, the House of Orange decided to break with the song which served them as heads of a faction, and the "Wilhelmus" was replaced by Hendrik Tollens' song Wien Neêrlands bloed door d'aderen vloeit, which was the official Dutch anthem from 1815 until 1932. However, the "Wilhelmus" remained popular and lost its identification as a factional song, and on 10 May 1932, it was decreed that on all official occasions requiring the performance of the national anthem, the "Wilhelmus" was to be played – thereby replacing Tollens' song. During the German occupation of the Netherlands, Arthur Seyss-Inquart, the Nazi Reichskommissar, banned all the emblems of the Dutch royal family, including the "Wilhelmus". It was then taken up by all factions of the Dutch resistance, even those socialists who had previously taken an anti-monarchist stance. The pro-German Nationaal-Socialistische Beweging (NSB), who had sung the "Wilhelmus" at their meetings before the occupation, replaced it with Alle Man van Neerlands Stam ("All Men of Dutch Origin"). The anthem was drawn to the attention of the English-speaking world by the 1942 British war film, One of Our Aircraft Is Missing. The film concerns a Royal Air Force bomber crew who are shot down over the occupied Netherlands and are helped to escape by the local inhabitants. The melody is heard during the film as part of the campaign of passive resistance by the population, and it finishes with the coat of arms of the Netherlands on screen while the "Wilhelmus" is played. First stanza of the "Wilhelmus"
The "Wilhelmus" is played only once at a ceremony or whatever other event and, if possible, it is to be the last piece of music to be played when receiving a foreign head of state or emissary. During international sport events, such as the World Cup, UEFA European Football Championship and the Olympic Games the "Wilhelmus" is also played. In nearly every case the 1st and 6th stanza (or repeating the last lines), or the 1st stanza alone, are sung/played rather than the entire song, which would result in about 15 minutes of music. The "Wilhelmus" is also widely used in Flemish nationalist gatherings as a symbol of cultural unity with the Netherlands. Yearly rallies like the "IJzerbedevaart" and the "Vlaams Nationaal Zangfeest" close with singing the 6th stanza, after which the Flemish national anthem "De Vlaamse Leeuw" is sung. An important set of variations on the melody of "Wilhelmus van Nassouwe" is that by the blind carillon-player Jacob van Eyck in his mid-17th century collection of variations Der Fluyten Lust-hof. The royal anthem of Luxembourg, called de Wilhelmus, has a shared origin with the Dutch anthem het Wilhelmus. It is in official use since 1919, and was first used in Luxembourg (at the time in personal union with the United Kingdom of the Netherlands) on the occasion of the visit of the Dutch King and Grand Duke of Luxembourg William III in 1883. Later, the anthem was played for Grand Duke Adolph of Luxembourg along with the national anthem. The melody is very similar, but not identical to that of the "Wilhelmus", since the melody of the latter has been adapted considerably in history. The melody is used, with rewritten English lyrics, as the alma mater of Northwestern College in Orange City, Iowa, USA. Northwestern College is associated with the historically Dutch Christian denomination the Reformed Church in America. Orange City, the college's location, is named for the House of Orange. Small local governmental districts, townships, are named Nassau, Holland and East Orange. The melody is used in the Swedish folksong "Ack, Göta konungarike [sv]" ("Alas, Gothic kingdom"), written down in 1626. The song deals with the liberation struggle of Sweden under Gustav Vasa in the 16th century. Een nieuw Christelick Liedt gemaect ter eeren des Doorluchtichsten Heeren, Heere Wilhelm Prince van Oraengien, Grave van Nassou, Patris Patriae, mijnen Genaedigen Forsten ende Heeren. Waer van deerste Capitael letteren van elck veers syner Genaedigen Forstens name metbrengen. Na de wijse van Chartres. A new Christian song made in the honour of the most noble lord, lord William Prince of Orange, count of Nassau, Pater Patriae (Father of the Nation), my merciful prince and lord. [A song] of which the first capital letter of each stanza form the name of his merciful prince. To the melody of Chartres. ^ M. de Bruin, "Het Wilhelmus tijdens de Republiek", in: L.P. Grijp (ed. ), Nationale hymnen. Het Wilhelmus en zijn buren. Volkskundig bulletin 24 (1998), p. 16-42, 199–200; esp. p. 28 n. 65. ^ "Facts About National Anthems". www.national-anthems.org. The words of the Japanese anthem Kimigayo date from the 9th century. ^ DeLapp, Nevada Levi (28 August 2014). The Reformed David(s) and the Question of Resistance to Tyranny: Reading the Bible in the 16th and 17th Centuries. Bloomsbury Publishing. p. 87. ISBN 9780567655493. ^ "Geuzenliedboek". cf.hum.uva.nl. Retrieved 14 August 2016. ^ "Louis Peter Grijp-lezing 10 mei 2016". Vimeo. Retrieved 13 August 2016. ^ "'Schrijver Wilhelmus is te ontdekken met computeralgoritme'" (in Dutch). Retrieved 13 August 2016. ^ "Toevallig op Petrus Datheen stuiten" (in Dutch). 11 May 2016. Retrieved 13 August 2016. ^ "Louis Peter Grijp-lezing online" (in Dutch). 22 May 2016. Retrieved 13 August 2016. ^ DeLapp, Nevada Levi (28 August 2014). The Reformed David(s) and the Question of Resistance to Tyranny: Reading the Bible in the 16th and 17th Centuries. Bloomsbury Publishing. pp. 88–90. ISBN 9780567655493. ^ DeLapp, Nevada Levi (28 August 2014). The Reformed David(s) and the Question of Resistance to Tyranny: Reading the Bible in the 16th and 17th Centuries. Bloomsbury Publishing. p. 155. ISBN 9780567655493. ^ a b van Doorn, T. H. "Het Wilhelmus, analyse van de inhoud, de structuur en de boodschap". www.cubra.nl. Retrieved 14 August 2016. Peter Koelewijn is a founding father of Dutch language rock and roll. Koelewijn is also a successful producer and songwriter for other Dutch artists. His most famous song is "Kom van dat dak af". Louse Wies Sija Anne Lilly Berthe "Lousewies" van der Laan is a retired Dutch politician of the Democrats 66 (D66) party and jurist. Scouting in Aruba shared a common history with the other Netherlands Antilles until the political separation of the island from the Netherlands. Scouting Aruba is a Full Member of the Interamerican Region of the World Organization of the Scout Movement. 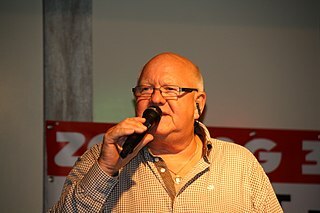 Henk Wijngaard is a Dutch country singer. Liliane Saint-Pierre is a Belgian (Flemish) singer who sings mainly in Dutch. Simon Berman was the mayor of Kwadijk, Middelie, Warder, Schagen, Bedum, and Alblasserdam in the Netherlands. He was the first mayor of Kwadijk, Middelie, and Warder to actually live in one of those villages. As a popular mayor of Schagen, he handled a double murder case that drew national media attention and advanced a professional school and regional light rail and canals. In Alblasserdam, he addressed the local impacts of World War I. Berman is also known for his association with Christian anarchism. Dolf Jansen is a Dutch comedian, host of the Radio 2 programme Spijkers met Koppen and an active Marathon runner. On television Jansen hosted Loods 6 (1991), Kunstbende (1992), Jansen slaat door (TROS) (1993) and Jansen op jacht (2007). He performed together with Hans Sibbel as the comedy team 'Lebbis en Jansen', but also performs as an individual comedian. He also is an ambassador of Oxfam Novib. Noto Soeroto (1888-1951) a Javanese prince from the Jogjakarta noble house of Paku Alaman was a poet and writer of Dutch Indies literature and journalist from the Dutch East Indies. He significantly contributed to the Dutch literary system by exploring new literary themes and focusing on indigenous protagonists, at the same time drawing attention to indigenous culture and the indigenous plight. Shirley Zwerus, stage name Shirley is a Dutch singer and pianist. Her records were released internationally on Fontana Records from 1969. Jeannette van Zutphen was a Dutch singer. Astrid Heligonda Roemer is a writer and teacher from Suriname living in the Netherlands. The Dutch-language author has published novels, drama and poetry, and in December 2015 was announced as the winner of the P. C. Hooft Award, considered the most important literary prize in the Netherlands and Belgium, which was presented in May 2016. "Hallo Bandoeng" is a song by the Dutch levenslied singer Willy Derby. It was released in 1929 and sold more than 50,000 copies, an astronomical number for that time. It was one of Derby's songs that became part of Dutch culture. The phrase "Hallo Bandoeng" was well known at that time, as the usual opening used by Radio Kootwijk when establishing a connection with Bandung, one of the more important cities in the then Dutch East Indies.